Pottery Mark - B B (one in reverse) germany blue china plate mark id:- Bought a set of dishes that have purple floral design in center but I can not id the mark although I have scoured the internet. Please see pic I have attached. If anyone can help I would appreciate it. mark has a blue stamp "germany" under wreath. looks like a crown with two "B"s in the center. Knowledgeable contributors please try to help more with this one. I don't have an answer, but I, too, have two pieces (plates in bright colors) with the exact same mark. I have not been able to identify the mark and I've searched the internet several times. If you have found information, please post int a comment, and I will do the same if I ever find anything. Thank you. I have an entire set of porcelain cannisters with wooden lids marked M1004 registered in Germany, and they also have the same mark with the two B's (one in reverse on the bottom. Would also like to know the history of these pieces. This set contains approx. 18 cannisters all in perfect condition. I was researching another query when I came across the solution to this particular conundrum. The mark is that of Beyer & Bock (1890 - 1960) of Rudolstadt/Volkstedt, Thuringia, Germany. They have a couple of variations to this double B mark and also a crown mark with 'B' (single). They also owned a trademark which they simply invented and registered called "Royal Rudolstadt". 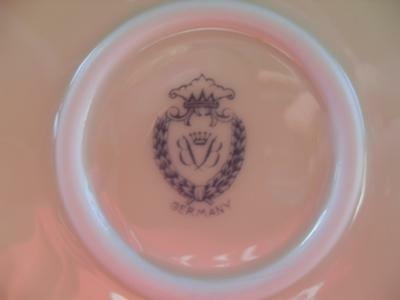 So if you see some porcelain pieces with the name Royal Rudolstadt, it is not the name of the company, but a brand of the manufacturer Beyer and Bock, dating from around c. 1905 - 20. Originally, it was a decorating studio, buying blanks from other makers, but I believe they soon did begin to make their own porcelain, but I am not sure exactly when this switch happened. Please post if you know. 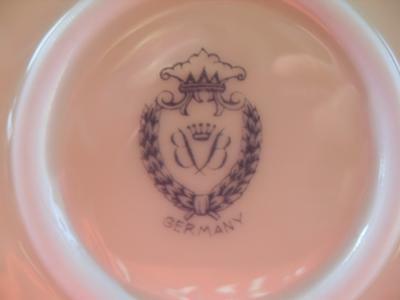 They were situated in East Germany, behind the iron curtain in the Soviet block and were nationalized in 1960 becoming the "Porcelain Factory Rudolstadt Volkstedt". I just purchased a 40 piece child's tea set. About 1/2 of the pieces have the blue mark in the picture, 1/4 have an orange mark that says Rudolstadt with a crown under it, below that is a shield shaped double line drawing with a B in the middle and Made in Germany under it. Some of these have numbers indented into the pieces. The remaining pieces are the matching saucers. These have no markings on the under side at all but the pattern on the top matches the rest of the set. This set includes 2 small tea pots with lids, 2 sugar bowls with lids, 2 creamer pitchers, 12 little cups, 11 little saucers and 11 little plates. The entire set is decorated with fat little children cartoons at play and strawberries. I have no idea how old this is, why the markings are different - guessing some of the pieces are replacement pieces? I have this same exact Maker's Mark stamped on the back of a Platter of some sort in Red Though. I am wondering do each of the colors represent a different Year? This is the first place I have been able to even find this Mark. Thank you sooo much for the info. for this mark I could not find it any where on line , I have a octagon bowl with hand painted flowers and on a light pastel background I would love to be able to find out what pattern this is because I have plates to match . the bowl also has a name (L.W. Freedley in red on bottom of bowl. if you can tell any other info . for this mark please do ! thank you again ! Currently researching the date for this !! The mark is for Beyer & Bock,, Volkstedt, Germany !! I have a four-sided white candy dish approximately 5"x 5". The marking is a red crescent shape with the letters B B (one in reverse) with a small crown between the B's. The word "Germany" just below the crest. Above the crest is a white raised star design about 1/2" in size. Any comments anyone?